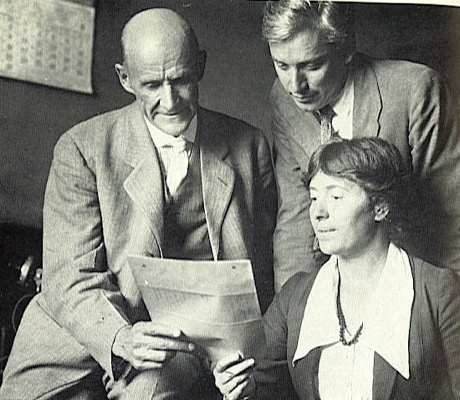 Eugene V. Debs, Max Eastman and Rose Pastor Stokes in 1918. As they regularly did the members of the Women’s Dining Club of Kansas City met for lunch in a downtown hotel one day in March 1918. Still two years away from gaining the vote, the ladies met to discuss the issues of the day. For this session there was a speaker, Rose Pastor Stokes, most of the members would rarely have encountered in their middle class lives in Kansas City. Rose Pastor Stokes was born in Russia, left for England when she was three and at age 11 immigrated to America. For the next twelve years she worked as a cigar maker in Cleveland. She began writing for the Jewish Daily News as well as creating poetry and plays. In 1903 the newspaper hired her as a full time reporter. On one of her assignments she met an old money WASP from a prominent New York family and, somewhat improbably, they soon married. Rather than climb the social ladder the couple moved to the slums and worked on labor issues. Stokes was a member of the Socialist party but resigned because of its opposition to World War I but reconsidered and rejoined. Her husband enlisted in the Navy after war was declared. Now she was on a speaking tour of Missouri, expressing her concerns about the war. On the day the Star ran the letter she was continuing her tour in Springfield, Missouri, where police banned her from speaking in a hall and then fined her $100 when she moved her speech out to the street. She later spoke in Sedalia. When she reached Willow Springs she was arrested by federal agents and taken back to Kansas City. United States Attorney Francis M. Wilson announced that his office had been following Stokes the entire time she had been in the state and made transcripts of all of her speeches. Solely on the basis of the letter to the editor, Stokes was charged for three violations of the Espionage Act. Congress passed the Espionage Act of 1917 making it a federal crime to, among other things, “cause or attempt to cause insubordination, disloyalty, mutiny or refusal of duty” in the military or “to obstruct recruiting or enlistment” of soldiers and sailors. Attorney General Charles Gregory said, “May God have mercy on [dissenters] for they need not expect it from an outraged people or an avenging government.” Treasury secretary and Wilson’s son-in-law William McAdoo declared, “every pacifist speech is in effect traitorous.” About 2,000 Americans were prosecuted under the act, most for just voicing their opposition to the war, including one voter in Iowa sentenced to twenty years in prison for opposing the reelection of a congressman who had voted for conscription. Due to her prominence in political circles and her connection to a society family, Rose Pastor Stokes’s trial was national news. The prosecutor attacked Stokes for her history of supporting birth control and not volunteering to work for the Red Cross as well as questioning her loyalty and patriotism. Members of the Women’s Dining Club along with other audience members from the speaking tour were called as witnesses. She testified in her own defense, denying she was against the war. On cross examination Wilson used a statement she made that she would not stand for the national anthem or salute the flag. Stokes was quickly found guilty. After the verdict, Stokes, still free on bond pending appeal, said, “If I keep my health I expect to continue my work and if I should be locked up it would make my efforts tremendously more effective.” At her sentencing hearing Stokes said: “If I have offended in expressing a criticism, which intimates that the Government is leaning to one class or another, it is because I have taken the provisions of the Constitution concerning liberty of expression too literally –a language plain and simple and made a part of the Constitution by an amendment thereto by those who recognized its importance during periods not alone of peace, but also of stress.” After condemning her as part of a “systematic program to create discontent,” the judge sentenced her to ten years in prison. While out on bond Stokes continued the fight, including appearing at the espionage trial of Socialist leader and presidential candidate Eugene Debs in the federal court in Cleveland in September, 1918. Stokes sat next to Debs and held his hand in both of hers as the guilty verdicts were read. The U.S. Court of Appeals for the Eighth Circuit located in St. Louis reversed the conviction two years later citing the judge’s improper charge to the jury without addressing the substance of the act. Stokes said: “I am neither pleased nor displeased. I don’t care. Had the news been the other way, it would not have made any difference to me.” She faced retrial on the same charges. After Warren G. Harding’s inauguration the Justice Department decided to drop the case against Stokes. Debs was soon freed from prison and met Harding in the White House. Stokes, perhaps radicalized and embittered by her brush with American justice, moved farther to the left, joining the Communist Party. She was divorced in 1925. In 1933 she travelled to Germany, just as Hitler was coming to power, to seek radiation treatment for breast cancer where she died at age 53. Her case might seem an embarrassing relic of the past, another case as outrageous as the ten year prison sentence under the Espionage Act served by Robert Goldstein in 1917 for producing a Revolutionary War drama, ‘The Spirit of ’76,” with anti-British content. But the current political environment is increasing mirroring the past, from a president who denounces any criticism as fake news, attacks the media as the “enemy of the American people,” and at one point advocated amending the First Amendment to make it easier for him to bring libel suits. It is only a matter of degree in the recent cases of the conviction of a woman for laughing during Jeff Sessions’s confirmation hearing, the arrest of a reporter for attempting to question a public official, and the cold blooded assault of a reporter by a Republican congressman. It rears its ugly head in the pseudo-press conferences filled with deliberate concealment and lies. The atmosphere of hatred and repression from the top staff of the White House is as venomous and dangerous as any generated a century ago. Learning the lessons of Rose Pastor Stokes is key to making sure it never happens again.